Most parents want their young people to join some form of activity, for a variety of different reasons. A concern may arise when the sport of motocross is chosen. These worries revolve around the fact that this particular sport can be dangerous. However, it is a very popular sport and one that thousands participate in and does so successfully. Once the decision has been made by an individual, no matter what their age, to get into motocross as a sporting activity, there is a lot that they have to learn and to prepare for. The person that’s going to participate in motocross has to understand the potential dangers they are facing realistically. They have to put a great deal of effort into learning what the safety rules are for this sport. Also, they have to learn how to ride efficiently, not only to do well in the sport but to provide themselves with as much protection as possible. Some individuals enter into the sport with the bike that they already have, and others that are entirely new to motocross want to buy a new bike. 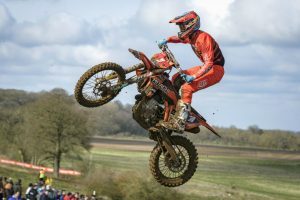 Seeing as they are going to be entering into the racing sector of the sport, they want to be sure to purchase a bike that is appropriate for motocross racing. In most cases, the age of the individual riding the bike will be matched to the engine size. Safety gear is just as essential as the bike itself. The objective when buying safety gear, is as a form of prevention, for any of the common types of injuries, minor or major, that can be sustained if a crash occurs. Most will agree that the helmet is the most critically important piece of equipment for protection in motocross racing. In most countries, that are running these races, or allow motocross riding, helmets are mandatory. There are different components of the helmet that the buyer must ensure are in place. It has to be in good condition, and fit properly. It must be able to be fastened appropriately and have a chin strap for retention. Protecting the eyes from airborne debris is done by wearing goggles. Again, a good fit is going to be important, without any part of the goggles restricting the vision. Other equipment includes body armour. These are called chest or back protectors. Riders sometimes tend to neglect to use them, because they find it difficult to get used to them. It is undoubtedly well worth the extra effort, to take the time to practice riding in motocross with these protectors so that they no longer become a distraction. They are essential for protecting the core body from injuries, that could occur on impact. It also protects the rider from debris hitting the body, caused by bikes in front, and to the side, of them. Most motocross riders want to enter the racing circuit. When they do, there is a lot that they need to learn here, as well. Before even considering this, there is plenty of practice that is needed. The new racer has to set up different courses for themselves, to be able to learn how to manoeuvre, with the speed that they are going to be exposed to, during races. Constant practice is important, not only for the success of the race but for safety as well.